The Synonym Editor enables you to make further modifications to your Cube synonym definitions. The Cube synonym is displayed in the Cube View tab. If you select a component of the synonym, its properties appear in the right pane. Edit field names and titles for measures, properties, and variables. You may also edit the field prefix for the defined fields. Edit titles for multiple languages, delete titles, and add titles for additional languages if you are using code page UTF8. Delete measures, dimensions, or parent/child hierarchies. View the usage and actual formats and the ability to change the usage display format for the field. Change an internal attribute value. Change the access property for variables. Change the field prefix used to create the field names, mandatory property names, and DEFINE field names generated for parent/child hierarchies by the Synonym Wizard. Create virtual measures (this is implemented with COMPUTE fields in the Master File). 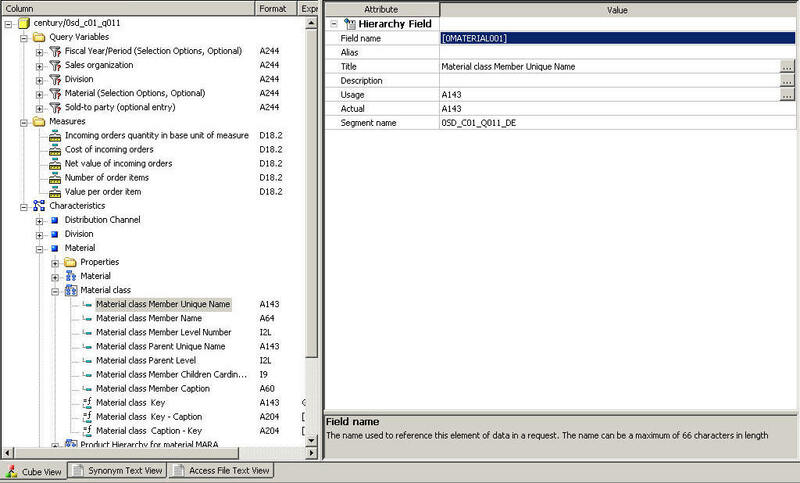 The following image in an example of an SAP BW Data Source in the Synonym Editor. For more information about using the Synonym Editor, see the Describing Data With Graphical Tools manual.